A camera obscura is a dark box with a small hole in the front. Light passes through this hole and lands on the back of the box, casting an upside-down version of the scene. Although this idea had been understood by scholars for hundreds of years, Leonardo da Vinci (1452-1519) was the first to write a detailed description of the camera obscura in his Atlantic Codex in 1490. An astronomer named Gemma Frisius (1508-1555) was the first to draw a camera obscura around 1545. Frisius, Gemma. 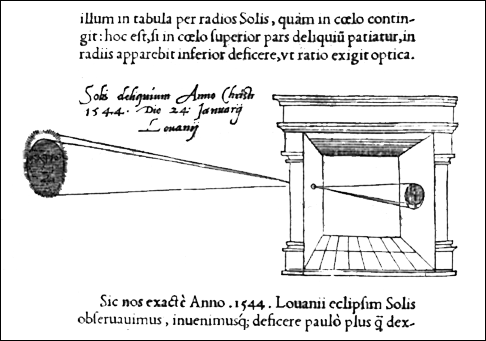 Gemma Frisius’ illustration of a camera obscura – 1545. 'De Radio Astronomica et Geometrico'. Accessed: 22 July 2010.